The photo is from an ‘A’ Course held at BBC Wood Norton in July 1970. Included in the group are trainees (left to right): Dave John, with Pebble Mill’s Keith Brook on camera, John Bennett, Tony Nicholson (he worked for the ILEA’s TV unit, (Inner London Education Authority). They made OU type programmes before the OU began). Thanks to Mark Kershaw for sharing the photo. 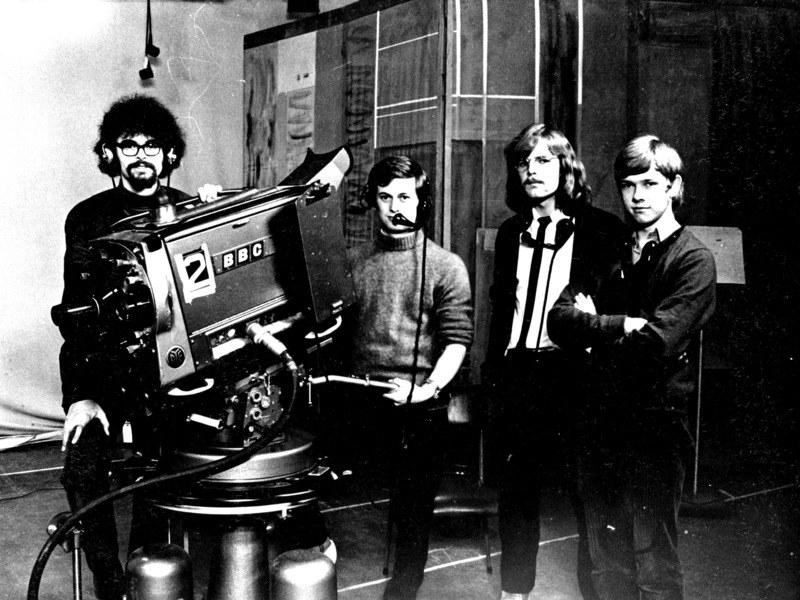 ‘The pic is August 1970, the final part of our A1 training course, where the 10 TV people split off from the engineers to train in the studio – then called “the Phoenix”. It was a converted indoor badminton court. I was told it was originally built with the insurance money after the top floor of Wood Norton hall burnt off, and the BBC didn’t rebuild it, just put a roof on! Hence called Phoenix as out of the ashes! (Not sure if true or not)! Later the bar took over the name. For intested the Studio now called Studio A is still in use! If my memory serves me correctly, the ‘A’ Course, starting in 1970, replaced the old Technical Operations (TO) Course to reflect the less technical aspect of life as a cameraman or sound bloke. And, yes, a man’s world in those distant days. There was still loads of technical stuff – knowledge of the tools is crucial to any job, not just TV or sound – but the ‘A’ courses concentrated more on learning the basics of how to operate the gear. The course lasted 3 months, and A1 took place in the middle of summer which was a scorcher that year. Bliss! In those days, the ‘A Block’ was the only one built of bricks and mortar. ‘B block’, where I lay my drunken head, was still a wooden hut from the war days, as were the classrooms! The course finished with two important items. Firstly, a programme that we were required to write, produce and shoot and which is sadly lost in the old 405 line cemetery. That’s me on the camera and the reason you can only see one leg is that I’m using my knee to stop the bloody thing from rising due to the heat!! Secondly was the end of course exam. I scored 97% despite having no sleep after crashing my car on the M5 after returning from an OB at Radio Merseyside. After moving the mess to the side they reopened the motorway. Intrigued at what might be in the boot of my upturned car, they opened it and everything I owned in the world spilled back onto the motorway, which had to be closed again. I was picked up from hospital in the morning by the BBC chauffeur who drove at 20mph so as not to alarm me. He was actually making me even more nervous because I was worried about missing the exam. A few days earlier I’d commented that no one had crashed their car that week. Dropping cars into the ditch halfway between the school and the BBC Club was a weekly event. Evidently is was my turn. After that it was off to TV Centre for me and then, two years later, Pebble Mill. You were lucky to have a set of matching cameras…on our C course (46) in 1964 we had two Marconi Mk 1’s An EMI vidicon and an Marconi 3″ IO !!! With respect to the above contributor, B block was not of wartime origin although it may have looked like it! B block was made of wood (Hardboard in places) and a temporary* measure at a time of expansion in the BBC in general. D block was the wartime Barracks with the communal showers for making new friends! The few Ladies at that time were accommodated in Sick Bay! Part 2 had Hut 16 as a classroom which was wartime. This course would have been when I was on attachment to Wood Norton, so A course 1 to 7. I think it may well have been number 1. Who remembers the fear of X block! PPM2 (valve) TS9, and adjusting bias on the Philips tape machines. (Forward to maximum then a quarter turn back). It was I who later replaced the mixers in X block with stereo ones, not before time! *Please refer to the BBC definition of Temporary. e.g. Temporary wartime Control Room in BH London, where I started in 1961.